When player NPCs reach a barrier that they are meant to walk around, they sometimes get too close to the walls and prevent themselves from properly walking around. This has effects ranging anywhere from sliding sideways along a wall until they forcibly pass it to the more extreme cases of slamming into a corner and never continuing, as shown in the screenshot below. 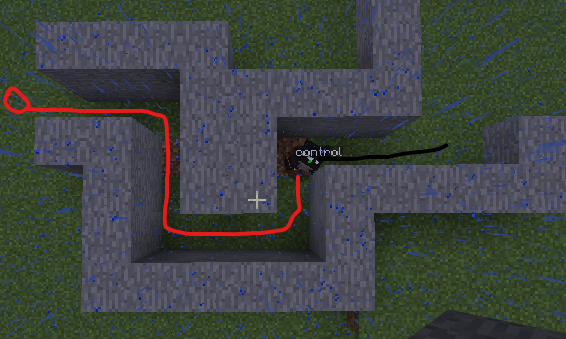 You can use /npc move further along in the desired path to force it to continue until it hits the next corner, so it does seem to be trying its best, but it will not move again on its own. Non-player NPCs seem relatively unaffected by this, and can navigate the maze without issue. A likely irrelevant side note: this issue exists both with use-new-finder enabled and disabled. In the case of it being disabled, I was unable to generate a path through the miniature maze in the screenshot altogether. This is a fairly problematic issue. In the process of testing #1740 I had to give the NPC an extra door because it kept slamming into the wall next to the door instead of walking through the open door. EDIT2: my general guess while looking at how it moves is that the NPC misunderstands its own precise position and is going for integer block coords instead. You can see that the NPC is significant farther off in this case. In both cases the path margin is 1. I think it's aiming for the lower edge of a block, rather than the decimal precise point. I notice when walking towards the door from the wrong side going straight through, it will for a moment turn towards the corner then reorient itself straight, quick enough that it actually manages to get through (when it doesn't actually need to rotate to get through). When there's even the slightest bit of angle (I'm testing with a roughly 30 degree angle here) it will get stuck on the wall, as it fails to achieve rotating at the correct time. Actually, when approaching from south (positive Z) it's able to achieve the rotation and get through. When approaching from north (negative Z) it fails to rotate. This lends more likelihood to it being a reaction based on the corner of the block rather than the center.